The Winnower | Hello Overleaf! I am a biologist. I work on Microsoft Word and use Endnote (*ducks in anticipation of tomatoes being thrown). Since entering into the world of scientific publishing it has become increasing clear that these are NOT the best solutions— not even close. But they are all I know and all that many life scientists know. This is changing, however. LaTeX, not to be confused with latex, the rubber used in condoms, is a typesetting system used to semi-automatically typeset beautiful documents. It has been used for decades primarily by physicists and mathematicians but has never taken off in the life sciences. Once something that had to be learned LaTeX is becoming something that anyone can use without any prior experience. Indeed, that has been my experience with Overleaf, a real-time LaTeX editor that allows the untrained user to creat beautiful LaTeX documents without any prior instruction. Oh yeah, it also allows collaborative writing, much like Google Docs. So, because it is obvious and because many of our users have requested it we are happy to introduce submissions to The Winnower via Overleaf! We have always allowed LaTeX submissions but we think that we can do even better by integrating with Overleaf, the typesetting platform formerly known as WriteLaTeX. Indeed, Overleaf is used by hundreds of thousands of authors because it is perhaps not only the next step for us but for many publishers. So without further ado! 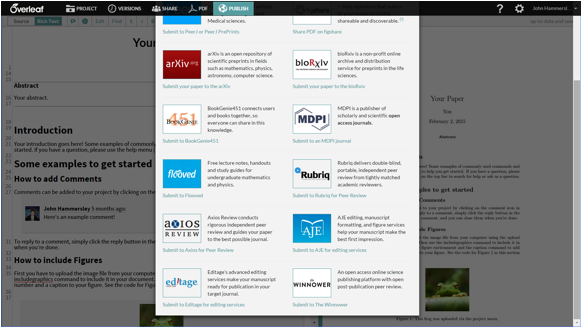 You can now submit to The Winnower via Overleaf by clicking here. Thanks Overleaf! This will be right place to generate free imvu credits as you will get full access in this virtual world.